Coloring Books For Girls Relaxation: Hearts coloring book contains over 35 heart coloring pages to color and enjoy. This coloring book incorporates a variety of detailed designs and creates hours of coloring fun for the older color enthusiast! Featuring a variety of illustrations that are ready to color, this coloring book for girls is sure to satisfy anyone who likes to color. Coloring Books For Girls Relaxation: Hearts coloring book will entertain even the most capable colorist. We have created this Coloring Books For Girls Relaxation: Hearts coloring book with an assortment of coloring pages for the older color enthusiast. With a variety of styles and designs from several talented artists, you are sure to find a coloring sheet that suits your mood. Girls need to have something to relieve stress just as adults do. Coloring in Coloring Books For Girls Relaxation: Hearts coloring book is a fun and positive way to provide that stress relief. Coloring is similar to meditation. There are studies that show that coloring provides many of the same benefits that meditation does. Coloring makes you feel relaxed just like meditation does. You get a beautiful piece of artwork out of it too! Coloring is fun. Friends will quickly gather around and start coloring if you bring an Art Therapy Coloring Book For Girls to the table! You will have a group of friends gathering around you in no time! 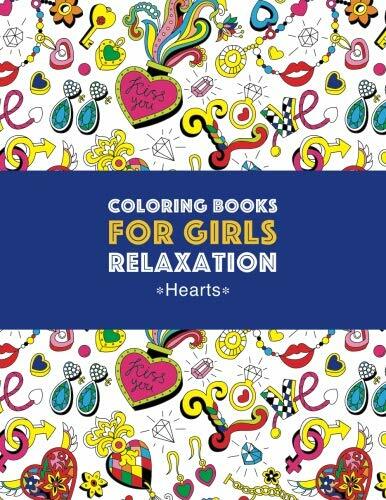 Have fun and begin coloring by ordering your copy of Coloring Books For Girls Relaxation: Hearts coloring book today! Older girls of all ages will enjoy coloring this coloring book. Coloring Books For Girls Relaxation: Hearts makes a wonderful Christmas or birthday gift!